I had a few friends over for a gathering a couple weekends ago, and even though it was meant to be an ice cream social, I wanted to have appetizers on hand as well. I talked about making sushi rolls for the first time in a while in my last post, and just in case that wasn't enough, or if they didn't turn out right, I thought I should have a backup of sorts. Besides, I was still trying to find ways to use all those overgrown basil from my patio! So I decided to make bruschetta (which, as I recently learned, is actually pronounced "bru-sket-ta," believe it or not! ), for the first time. I knew it would be a bit risky to try something new when I'm trying to prepare for a party, but I didn't know what else to make, so bruschetta it was! I searched the internet for a recipe, and one from AllRecipes.com looked particularly promising. I thought the inclusion of sun-dried tomatoes and balsamic vinegar was creative and sounded just fabulous. Besides, the near-perfect average rating of 4.8 out of 5 from 1491 people can't be a fluke, right? The procedure is simple enough; the only trouble I had was making sure I got the bread out of the oven before it burned! Oops! Apparently I need some practice with using my broiler... 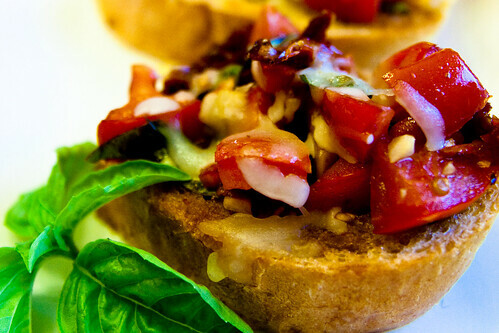 But, these bruschettas garnered RAVE reviews from my guests - even the ones with the burnt bread! Someone even asked me for the recipe the next day. This was definitely a 6 out of 5 star recipe, and something I'll be making again for sure!